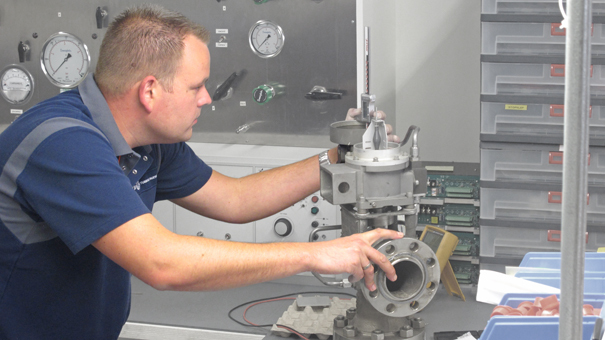 Meggitt valves are highly accurate, precise and reliable, providing gas turbines with the consistent control required to perform efficiently at peak performance. Fast and resilient, Meggitt’s hot air purge and blow-off valves optimise important operational procedures like fuel purging and load shedding, increasing safety, efficiency and reliability. Often fitted in pairs to provide dual redundancy, they are highly reliable and very fast-acting. Compressor bleed air is used to perform many vital ancillary gas turbine functions, including combustor fuel purging. Many industrial gas turbines are ‘dual fuel’ running on diesel as well as natural gas. When switching back to gas, even small amounts of residual diesel would quickly ‘coke up’ the fuel delivery tubes and nozzles if the combustor was not first cleaned — or ‘purged’ — using hot, high pressure bleed air from the turbine’s compressor. Meggitt’s sleeve-style, hot air purge valves control this important process with exceptional reliability, speed and precision. Meggitt part C327335 is a three inch sleeve style hot compressor air purge valve. Available in 24 or 125VDC for use on Aero-derivative gas turbines. Meggitt part C327405 is a three inch sleeve style hot compressor air purge valve. Available in 24 or 125VDC for use on Aero-derivative gas turbines. Meggitt part C327765 is a three inch sleeve style hot compressor air purge valve. Available in 24 or 125VDC for use on Aero-derivative gas turbines. Meggitt part C327345 is a three inch sleeve style hot gas vent for Aero-Derivative gas turbines. Available in 24 or 125 VDC. Meggitt part C327775 is a three inch sleeve style hot compressor air purge valve. Available in 24 or 125VDC for use on Aero-derivative gas turbines. Meggitt part C327785 is a three inch sleeve style hot gas vent for Aero-Derivative gas turbines. Available in 24 or 125 VDC.